Grand Theft Auto IV (commonly abbreviated as GTA 4 or GTA IV) is a sandbox-style action-adventure video game developed by Rockstar North,[ and released for the PlayStation 3,PC and Xbox 360 in Oceania, Europe, and North America on 29 April 2008,and in Japan on 30 October 2008. A Windows version of the game was released in North America on 2 December 2008 and in Europe on 3 December. It is the sixth 3D game in the Grand Theft Auto series. Two episodic packs have since been released for the Xbox 360, the first entitled The Lost and Damned and was released on 17 February 2009. The second is entitled The Ballad of Gay Tony and was released on 29 October 2009. Both episodes are due to be released for PlayStation 3 and Microsoft Windows on 13 April 2010. 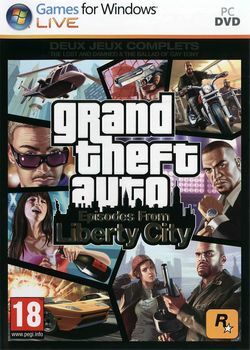 The game is set in a redesigned rendition of Liberty City, a fictional city based heavily on modern day New York City. It follows Niko Bellic, a war veteran from an unspecified country in Eastern Europe. He comes to the United States in search of the American Dream, but quickly becomes entangled in a world of gangs, crime, and corruption. Like other games in the series, GTA IV is composed of elements from driving games and third-person shooters, and features “open-world” gameplay that gives players more control over their playing experience. It is the first console game in the series to feature an online multiplayer mode. Improved combat system – Now you can use cover and also a target lock system, which allows you to take out targets with greater ease and accuracy. Plus, you can engage in some hand-to-hand combat if you can’t get your hands on a piece quick enough. Cell phone – Not just for basic phone calls anymore. Use your in-game cell phone to receive missions via SMS, snap photos, and ZiT (tag) songs that can be downloaded exclusively on Amazon.com/mp3. Free time – In between missions you can take advantage of “me” time. There are gentleman’s clubs, comedy clubs, bowling alleys, and bars, which all house unique activities. Take a break from the storyline – A variety of side missions allow you to help run a car service, “borrow” cop cars, assassinate targets, help solve problems for those on the street, or take to the air with stunt jumps that are scattered all over the city. Control your own fate – Throughout the game choice moments will arrive causing you to make a decision that will affect relationships and money.